Cathy was fighting for her life against the harsh winter we all experienced this year. 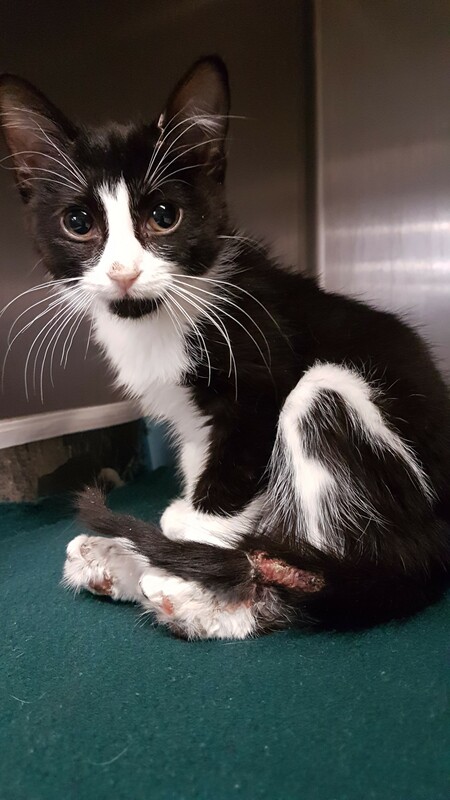 She came to the WHS three weeks ago suffering from some of the worst frostbite we’ve ever seen all over her tiny body. She has frostbite damage on her feet, tummy, tail and back. The skin on her back is hard, dead, and peeling off. Most of her tail was dead and needed to be amputated. Cathy was immediately given strong medication to relieve her pain when she arrived. Her back feet suffered the most severe frostbite damage needing immediate attention. Not only were her feet hard and painful from dead skin, they also got infected and full of pus. If Cathy hadn’t been rescued, she would’ve probably died from her infections. Right now, Cathy is being intensely monitored by WHS veterinarian Dr. Youngs. She treats Cathy’s injuries daily with bandage changes, hydrotherapy, and medication. She takes Cathy home to ensure she is comfortable and pain-free at all times. Cathy has a very long road to recovery ahead. She is going to have more surgeries to repair her back feet, and because she also lost major tendons in both, she will need to learn to walk again. Cathy is small, but mighty. We see her determination every day and we know she wants a second chance. Thanks to YOU she is getting the surgeries, medications, and care she needs to make a full recovery. Our annual 1001 Donations Telethon, presented by Vickar Automotive Group, is TOMORROW, March 23 and we need your help to raise $60,000 so we can keep saving the lives of helpless animals in our community. These funds are essential for the WHS to care for over 8,000 animals this year. Please make a donation today and help us help them. All donations up to $60,000 are being matched dollar-for-dollar by six generous donors. This means $60,000 will become an amazing $120,000! Tune in from 11 a.m. to 5 p.m. as we broadcast live from the WHS on winnipeghumanesociety.ca to see your donation dollars at work. We will share stories of more animals like Cathy, along with WHS volunteers and staff who work tirelessly to make sure every animal gets a second chance to live a happy and healthy life. We couldn’t save the lives of animals like Cathy every day without you. Thank you so much for making a difference.